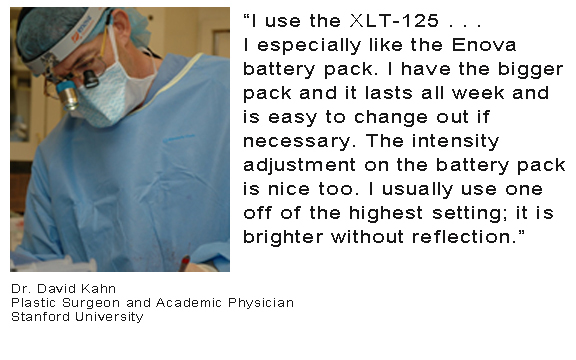 In May 2013, Shedding Light published the article, “Top Three Criteria Surgeons Consistently Request in LED Surgical Headlights.” Based on the interest in that article—and the fact that battery life is a top concern for surgeons when purchasing LED headlights—it made sense to take a closer look at battery packs and how to evaluate them when considering a new LED surgical headlight purchase. Enova’s Digital Battery Packs. The visual indicators on the left of each pack will blink when the battery becomes depleted; the up and down arrows control light intensity. Battery packs are essential to an LED headlight system as they provide the electrical power to energize the LED chip, which in turn provides the illumination. 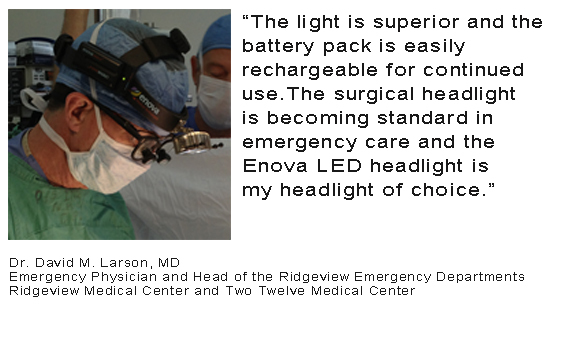 Further, battery packs make LED surgical headlights portable allowing surgeons complete mobility in the OR. They are a convenient alternative to fiber optic light sources of the 1980s that require a surgeon to be tethered by a 6’ to 10’ fiber optic cable. Most LED headlight battery packs use lithium-ion or lithium polymer battery cells that are fully rechargeable and far more powerful than traditional alkaline or nickel-cadmium cells. Lithium-ion or polymer battery cells are light-weight, dependable and have become standard in most battery powered items from power tools to cars, and even airplanes. Battery packs require both on-off and light intensity controls. Earlier versions included knobs or switches. More recently digital, or membrane circuitry, has become the state-of-the-art in control technology. LED headlight battery packs are proprietary to each manufacturer’s headlight. They are a sophisticated combination of circuitry, voltage and amperage. One cannot mix and match headlights to battery packs unless the manufacturer offers more than one battery pack option. 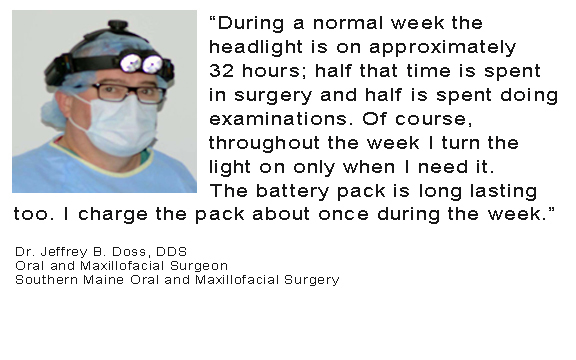 Here are the top three factors to consider when purchasing an LED surgical headlight and its companion battery pack. 1. Battery Life. Battery life is measured in hours and is the length of time that a battery can power the headlight. Battery life can range from as little as 2 hours to as long as 24 hours depending on the brand and illumination (Lux output) of LED headlight used. It is principally dependent on headlight intensity – the higher the intensity the shorter the battery life. Adjustment of LED headlight illumination intensity is usually controlled or adjusted on the battery pack. When comparing battery life from one brand to another, the number of hours quoted most commonly will be hours at maximum intensity. Most surgeons use headlights at highest intensity for maximum brightness, but should understand that even a minimal decrease in intensity will result in significant increase in battery life. 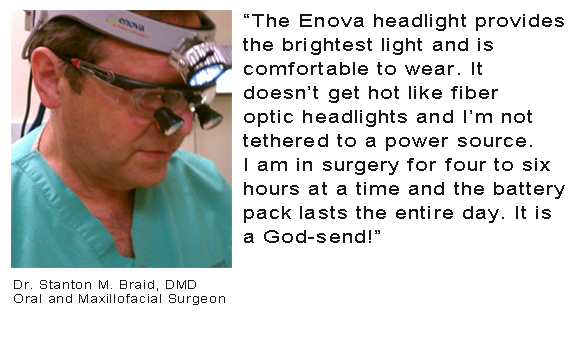 *Enova Illumination LED surgical headlights are designed entirely with aluminum lamp housing which functions as a heat sink and thereby eliminates the need for a fan to cool the LED chip. Aluminum lamp housing—Enova lamps use no synthetic or plastic components—also provides unparalleled durability. 2. Battery Life Indicators. Battery packs should have both visual and audible battery life indicators. Visual indicators are like a “gas gauge” which will began to flash or blink as the battery becomes depleted. 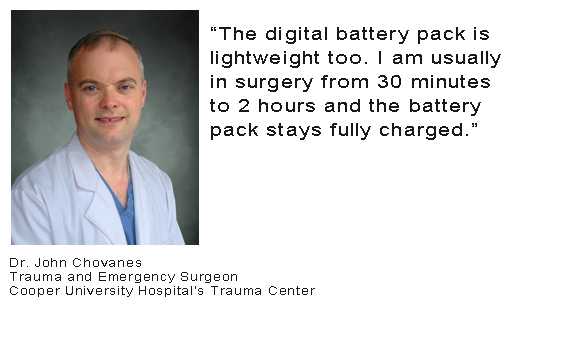 Higher quality battery packs will also offer an audible indicator which is especially helpful when you’re in surgery and the battery pack, often covered by surgeon’s scrubs, may not be easily visible. Once a surgeon or staff hears the “beeping signal” alerting that battery life is low, they can easily swap out battery packs without sacrificing downtime during surgery. 3. Battery Charger. A battery charger is necessary to charge lithium-ion battery packs after use, and charging time should take no more than 2-4 hours. It should be included with LED headlight system and is most convenient if it can easily be plugged into battery pack without special adaptors. Battery pack docking stations may be available too. Note: Just as battery packs are proprietary to each brand of headlight, so too are the chargers. 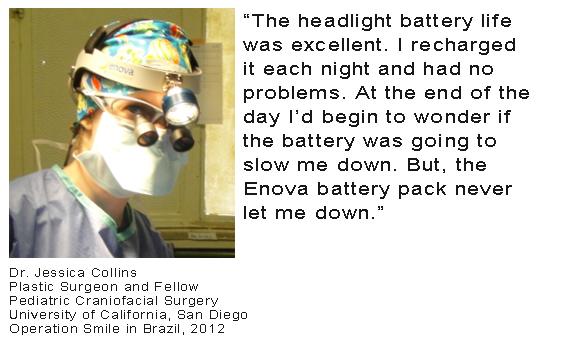 Evaluating an LED surgical headlight and the battery pack that powers it will ensure you will be satisfied with it. Enova offers a no-risk evaluation program that lets surgeons evaluate Enova LED surgical headlights for up to 30 days without risk or obligation. Learn more.